Do you already use SharePoint as a central hub for team collaboration and business processes, or just considering it yet? In this video, we’ll discuss the many benefits that the SharePoint platform brings to businesses. You will learn about a variety of SharePoint use cases, including content management, web portals, enterprise search capabilities and business intelligence. Don’t hesitate to see all the great outcomes SharePoint can bring to your organization! Is your SharePoint server virtualized or are you currently weighing the pros and cons of virtualizing it? Watch this episode to find out what challenges come with SharePoint and how virtualization can help you address them. Due to its critical role in enabling the Always-On Business™ and its deep integration with other Tier-1 applications, SharePoint requires 24/7 availability. 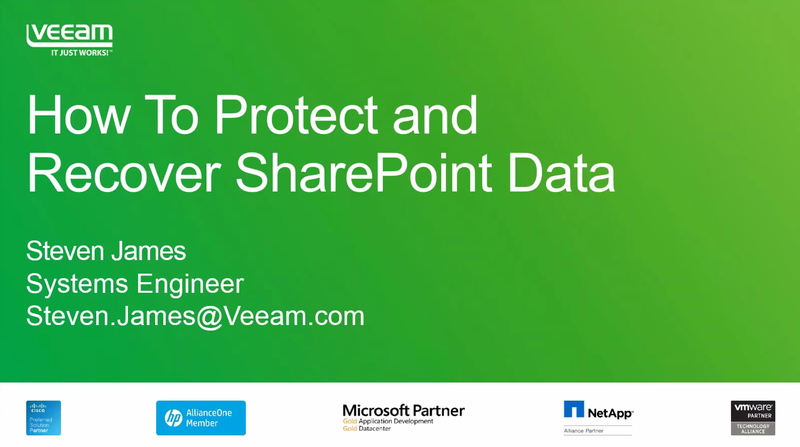 While Microsoft official documentation claims that “You can’t back up or restore everything in a SharePoint environment,” Veeam® experts will dispel this myth and explain how you can achieve SharePoint availability with virtualization and Veeam. Do you want to learn best practices for SharePoint backup and restore?